NUDGEE College at Boondall unveiled a 13-tonne sculpture on October 25 to highlight its strong connection with the bush in the Year of the Outback. Gold Coast sculptor Chris McKenzie created the image of an Australian bushman from granite, set on a nine-tonne pedestal more than three metres high. The bushman is captured in a characteristic laconic pose gazing down from his perch. 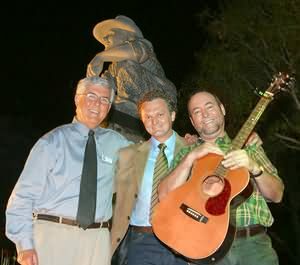 National chairman of the Year of the Outback Bruce Campbell and singer/songwriter John Williamson joined Nudgee College principal Daryl Hanly and thousands of students, parents and teachers at the unveiling of the ‘True Blue’ sculpture. It started with a march past by the Light Horse Brigade and John Williamson performed his composition True Blue. A bush dance followed in the college’s McKennariey Centre with the Royal Bounty Bush Band.